So. 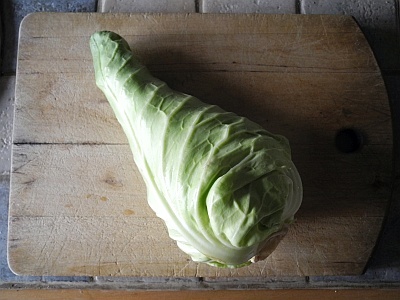 We had cabbage – the most bizarre, pointy-headed cabbage, which is why I couldn’t resist it when I saw at Dirty Girl Produce – and also Christopher Lee’s Italian sausages, and I ran across this recipe, in a Bon Appetit feature (from google) promising 29 recipes to make you love cabbage. Of which many sounded as though they would. 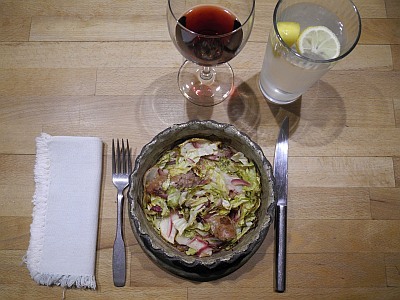 The recipe says it serves four, and there are two of us, so we made some approximation of 1/2 the recipe of cabbage, apple, and onion, though we used only 1 sausage, about 1;4 the recipe, in deference to D’s usual tendency to minimize meat in any recipe. Half an apple from our tree; some amount of red onion. It was great! Should note that D chose 1/4 tsp of Kosher salt as the amount to add (unspecified) and that worked great. 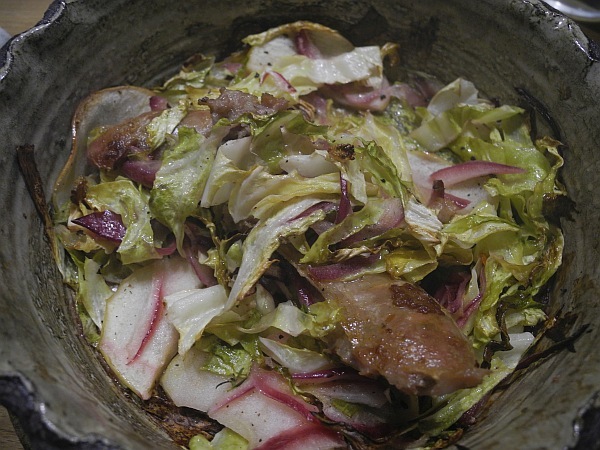 We mixed the cabbage, apples, and onions, in a mixing bowl and added the olive oil, vinegar, salt and pepper there and mixed well. Added the mixture to oven-proof bowls (handmade by the late Mary Grabill of Coconut Grove), and baked about 35 minutes, adding the sausage (cooked on as many sides as it would rest on, then split lengthwise to cook the inside well) as soon as it was done. 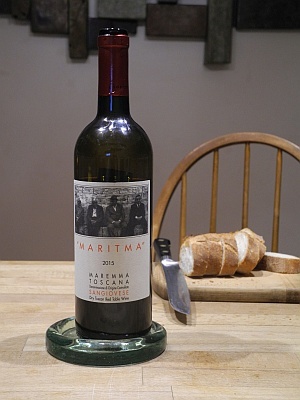 D chose one of the wines from K&L, a Toscana Sangiovese called “Maritima” (the 4 Old Guys) 2015. We liked it fine, but it was not a standout (unsurprisingly, at $8.99). Good enough, especially for the price, but not one we anticipate buying again. 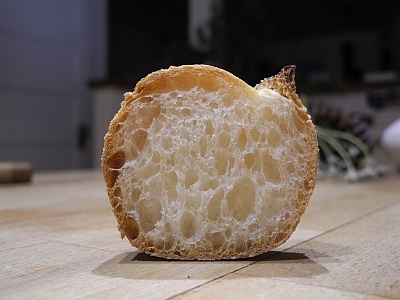 I defrosted the last bit of Acme Sweet Rustic baguette, which had a tendency to look like a curled up cat to me. D made popcorn later, but somehow got a clove of garlic in my portion. How the heck??? This baguette slice reminded me of a cat. Defrosted four slices from yesterday’s Acme Italian Batard, a bite-able bread, so I could put tomato on my sandwich and not worry the tom would skoodge out the other side when I bit into it. Danke cheese from the Bowl again (on sale/tasting when I was there), romaine, Ella Bella tomato (dry-farmed early girl from Washington) from the Bowl, mayonnaise. 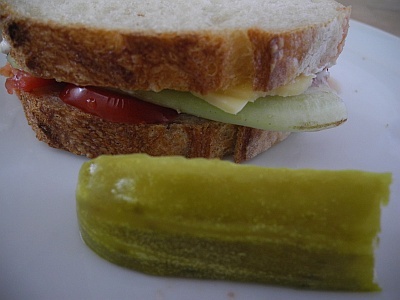 It was a delicious sandwich! Added a Clausen Kosher Dill pickle spear, and D chose R&E’s most recent IPA to drink, and all was well. 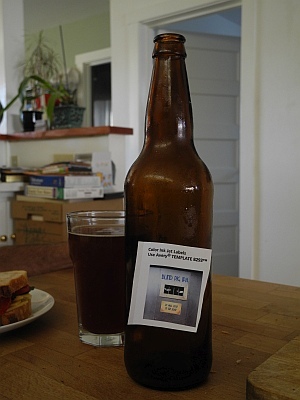 This entry was posted in Sausage and tagged ale, Apples, beer, Cabbage, Cheese, Christopher Lee, India Pale Ale, IPA, K&L Wines, Lunch, Onions, Sandwich, Sausage, Toscana, Toscana rosso. Bookmark the permalink.